There are many plant foods that are toxic or poisonous. Cassava (also called yuca or manioc) is a plant with a starchy root that is a popular food item in the tropics. The outer surface contains a glycoside that can cause poisoning of the body’s energy metabolism. Processed tapioca does not contain this poison. West Africa has a particular problem with this toxin, cyanogen, since people there rely heavily on cassava as a staple. Symptoms can include blindness (amblyopia) and nervous degeneration (ataxic neuropathy). Lima beans, sorghum millet, kidney bean, garden pea, sweet potato, Indian gram, and almond also contain certain amounts of this cyanogen. By soaking and washing the food, the risk is reduced. By sprouting the food, risk is considerably reduced. Cassava should be avoided or at least not served as a staple. These common foods can be used as natural antibiotics. Oxalates are substances found in spinach, rhubarb, celery, beetroot, parsley, almond, and tea that bind calcium and other divalent minerals and carry them out of the intestinal tract. Phytates are similar substances with similar action but are found in whole grains like wheat, rye, oats, and barley. In grains, the phytates are reduced considerably by the fermentative action of yeast. Thus unleavened bread is much higher in phytates. Both oxalates and phytates can lead to mineral deficiencies in large amounts are consumed and the diet is low in certain minerals. Residents of the Middle East consume a low-zinc, high-phytate diet that can stunt growth and retard sexual development. The natural flavor of root beer used to come from sassafras. Sassafras contains copious amounts of saffrole, a cancer-causing agent, and therefore is now banned. Potatoes and a number of spices have harmless amounts of saffrole. Goitrogens are substances found in plants that interfere with iodine metabolism. 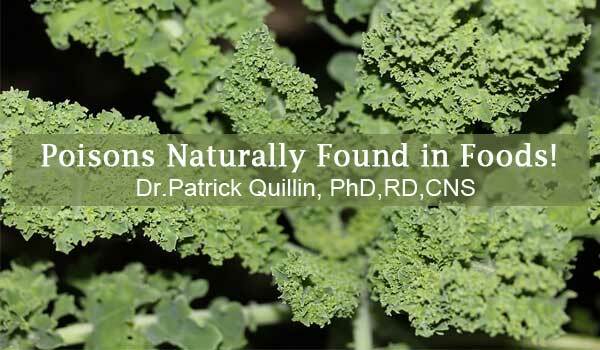 Cabbage, turnip, cauliflower, kale, brussels sprouts, broccoli, and soybeans contain this iodine-binding agent. Regular intake of these vegetables in a raw state combined with a low-iodine diet could produce goiter in those with thyroid problems. Cooking these foods nearly eliminates goitrogens in the diet. Brussel sprouts can contribute to improved vision. Lathyrogens are substances that are protein in nature and found in the garden plant vetch. The lathyrogens in this pealike plant can cause skeletal deformities or paralysis if consumed to excess. In India, where vetch is usually a small part of the diet, this occurs only when availability of other foods diminishes. Seeds of the cycad plant, found in the Pacific islands, are susceptible to bacterial attack when consumed and can produce a potent cancer-causing agent, cycasin. These seeds should be soaked, washed, and cooked to minimize the hazard. Solanine is a deadly chemical found in sprouting potatoes that has an action similar to nerve gas, disabling the central nervous system. All potatoes contain some solanine, but only those exposed to the sun and beginning to sprout contain deadly amounts. Potatoes with green shoots on them should be disposed of. Trypsin inhibitors are found in soybeans, peanuts, navy beans, and lima beans and will inhibit protein digestion in the intestinal tract. Steaming, cooking, or sprouting will deactivate these potent substances. Lectins are another potent toxin found in legumes and neutralized by cooking or sprouting. Raw egg whites contain avidin, which binds to the B vitamin biotin. Ex­cessive consumption of raw eggs could create a biotin deficiency. Cooking denatures avidin and renders it harmless. Hemaglutinins are protein substances that cause the blood cells to clump together, thus impairing their normal function and potentially leading to cardiovascular ailments. Found in soybeans, Guatemalan red bean, Indian red gram, and Philippine mung bean, these substances are inactivated by soaking the beans in water before cooking. Psoralens are a potent carcinogen found in all parsnips. Comfrey tea is a favorite among some health enthusiasts. The leaves have been found to be carcinogenic in rats, and the leaves and roots can cause liver damage. Those people trying to pick their own comfrey had best be plant experts. Foxglove, containing the potent heart medicine digitalis, is a dead ringer for comfrey. Caucasians who are native to the Mediterranean area have an inherited vulnerability to illness when they consume fava beans. Favism causes illness in all people and anemia in young children. Drying and aging of the fava bean reduces the toxicity. Plantains (a species of banana) contain a substance that induces a common heart condition in the Mrican tribes who consume this food regularly. Cooking significantly lowers the risk. Hypoglycins found in the Ackee fruit of the tropics can seriously lower blood sugar. Djenkolic acid found in a bean popular in Indonesia causes the kidneys to excrete valuable body sub­stances. A purple mint plant found in the United States and Asia (Perilla frutescens) can cause various lung disorders. The Great Plains of America produces some plants that have unusually high levels of selenium from the soil and can induce nervous disorders. Tetradotoxin is found in the ovaries and liver of the pufferfish and is lethal. Ciguatera is a poison found in tropical fish such as grouper. The Centers for Disease Control in Atlanta estimates that 50,000 people annually are stricken with this toxin. This is the primary condition treated in emergency hospital units near tropical coral reefs. Less than I percent of the cases are fatal. Certain fish, clams, and shrimp contain thiaminase, a substance that destroys thiamin in the intestines. Thiaminase is destroyed by cooking. The trendy raw fish (sushi) bars do not make good health sense for this reason and because raw fish may contain larvae of parasitic organisms, which are killed when cooked. There are many other naturally occurring toxins in food. Certain mushrooms contain deadly poisons. Hemlock, renowned for its lethal effect on the ancient Greek philosopher Socrates, can also poison humans who eat birds or animals that have consumed hemlock.